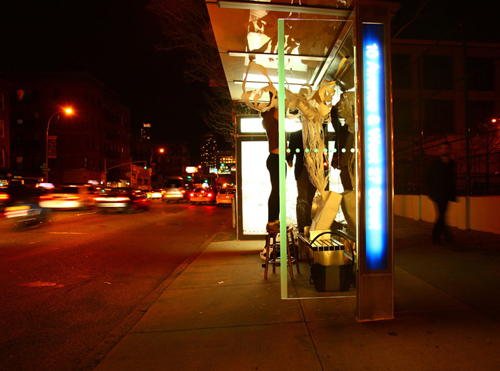 Since the never-ending "War on Terror" commenced so publicly a decade or so ago, an intermittently insistent campaign exhorting the public to be aware of odd things and behaviors has beat a steady message of fearful dread in New York. Posters on buses, brochures in city offices, and disembodied, firmly voiced recordings on trains and in airports remind us that evil walks secretly amongst us and we should be ever-vigilant and tell the nearest police officer if you see something suspicious. Aside from the obvious challenge of staying alert on the morning subway ride when you haven't gotten a coffee yet and you stayed up until 2 am playing "Call of Duty: Modern Warfare 3", the plain fact is that most New Yorkers have no idea what strange looks like. We lost that ability sometime after hippies and freaks turned into punks and goths, pants dropped below butts, zombies had parades, "no pants day", men started making out with each other on park benches, and of course Donald Trumps hair. For something to catch our eye these days it would need to be levitating or in some way involve chocolate. Otherwise, we'll keep walking and texting. 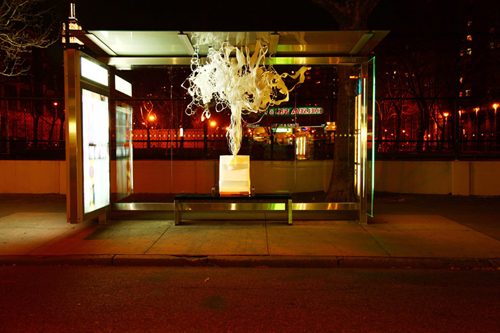 The billowing cloud rising in Manhattan this time is from artist Jean Seestadt, whose cut paper installation in the bus stop entitled "If you See Somethin" evokes one prevailing vision of the unmarked package spilling forth it's curvilinear bilious hot plume into a public place with a stylized hand. On a warmish evening last week it went up on this buzzing island metropolis without anyone saying something. 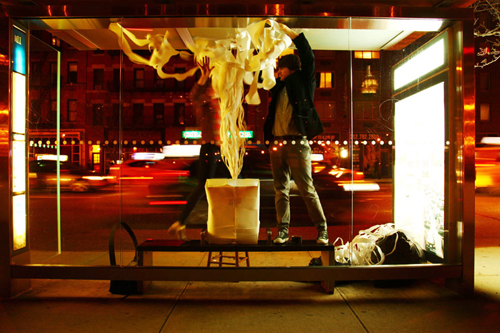 Following a similar installation in the subway a few weeks ago, Seedstadt brought her new installation to a well lit bus shelter on the street. 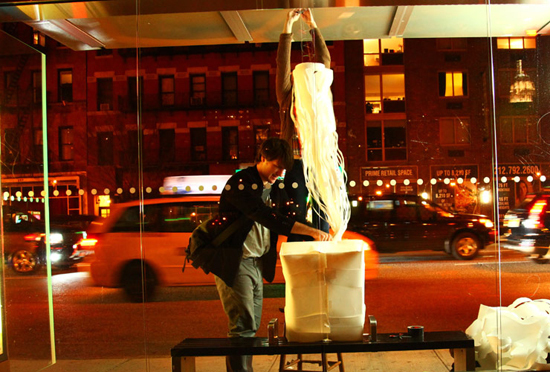 Aided by a stool, a roll of tape, some scissors, and her good friend Nick, Jean rolled up her sleeves and installed her new work while some people stood by looking, pawing through their mobile devices, or leaning forward to preen down the street for a bus. Cacophonic truck and car traffic, including periodic police cruisers, rattled by in the night while the two enterprising Street/Public Artists took turns teetering on the stool to get it to hang just so. If anyone paid attention at all, no one said something to the artist or her assistant. You see?? Brooklyn Street Art: You have done painting and ink work previously. 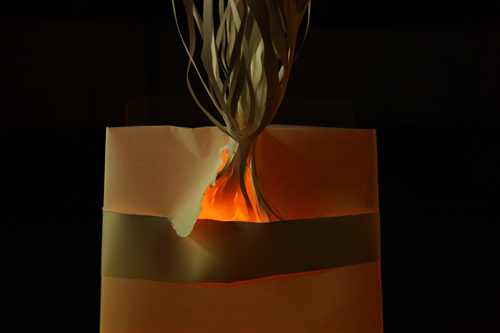 What do you think of cutting paper? Jean Seestadt: Cutting paper has all the things I like about painting and works on paper, I love the tedious beauty to it, but I was having a really hard time feeling that I could reach a viewer to the fullest when I am forced in a square 2D format. Also, the process of letting go of the overly crafted piece and knowing it is eventually going to turn to litter is a real release. 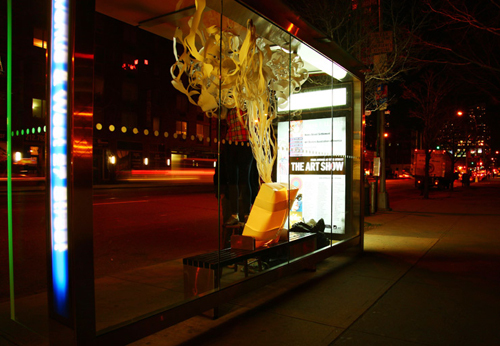 Brooklyn Street Art: Would you say these are sculptures? Jean Seestadt: They are very sculptural... I guess I think of them more as site-specific installations. They have no meaning when they are in a static setting. Brooklyn Street Art: What leads you to mount this work in such a public place? Jean Seestadt: I was interested the fragile, traditional paper cutting medium being forced into a public context. 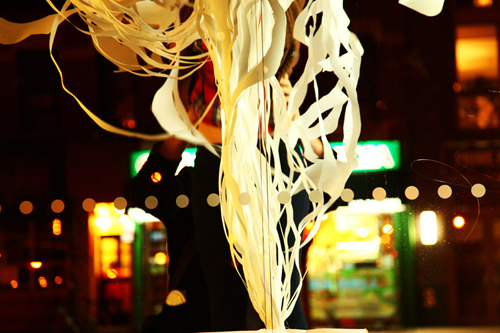 Each piece will be eventually be broken down by either the viewers or by the environment. Because it is not in a precious space the viewer can approach the work however they'd like-if that means touching it, ripping it, taking it, or taking care of it. The piece doesn't really work without people feeling free to do whatever they want. 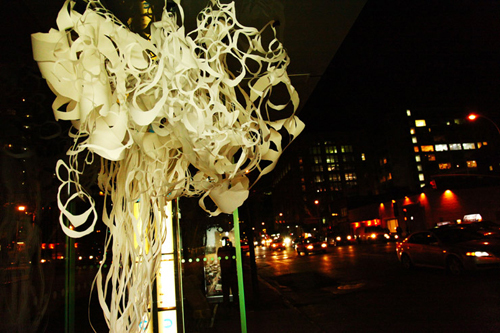 Brooklyn Street Art: Have you seen paper cut work by street artists? Jean Seestadt: I've only heard of Swoon... it doesn't seem like the ideal material for street art because it only last for a day if you are lucky. But street art is all about the temporal nature of the city's surroundings so I think it makes a lot of sense as a medium. 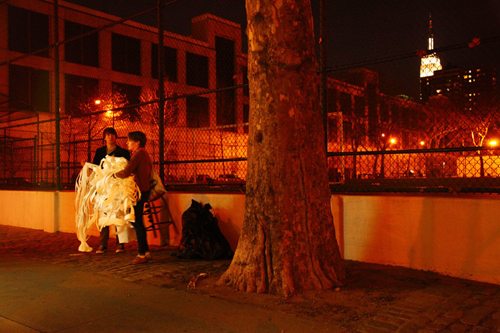 Brooklyn Street Art: What makes you explore the theme of "If you see something, say something"? Jean Seestadt: I was interested in the daily reminder we all digest about terrorism and how it is a fragile ghost of this city. It just floats about our transit system and I thought it was really sad and strange. People might think I am making light of terrorism but I am really not. This article also posted on Brooklyn Street Art.